Smooth 4K 60fps playback when casting from YouTube. 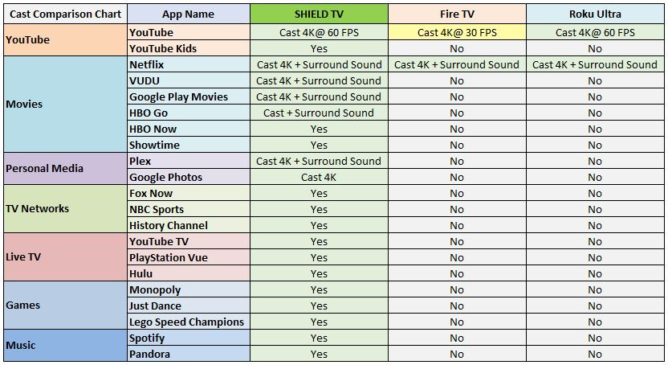 NVIDIA was bragging nice enough to provide a new comparison chart for casting capabilities between its SHIELD TV and the Roku Ultra and Fire TV. The head-to-head doesn't do either of those any justice, proving how far behind they are in supporting several sources. However, if I'm not mistaken, this is a look at the "casting" functionality only, which is the ability to send or mirror something from your phone to the TV, and it doesn't say anything about local apps for directly streaming through these set-top boxes. The difference might not be as dramatic in that regard, but it is telling that Android TV (and SHIELD by extent) really make it easy to move from the small screen on your phone to the large screen on your TV with little hassle and without losing on options and quality.